Home » » Armed Robbers Invade Foreign Manager In Lagos Supermarket. Armed Robbers Invade Foreign Manager In Lagos Supermarket. 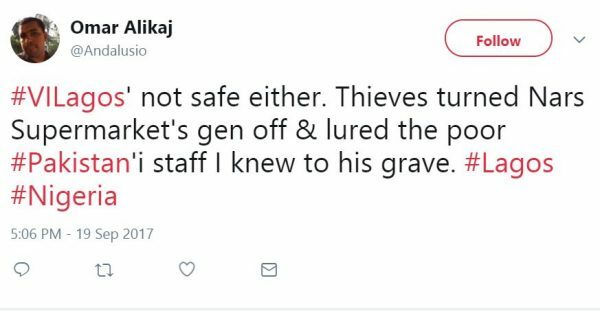 A Lebanese man based in Nigeria, Omar Alikaj has narrated on Twitter how a Pakistani supermarket manager was brutally murdered by armed robbers who attacked the Nars Supermarket in Victoria Island area of Lagos state. He has called on the police to fish out the criminals as the area is no longer safe.